Hotel Transylvania 3 DVD and Pillowcase Treat Bag Giveaway! Two Mini Movies and More! On Blu-ray™ Combo Pack & DVD on October 9th! My kids have been so excited to see Hotel Transylvania 3 since they saw we could pre order it on direct tv. We have seen the whole series and it is one of the kids dvd series I truly enjoy myself. My daughter and two sons all can agree and enjoy watching Transylvania together. With Halloween coming we wanted to let you know you could get Hotel Transylvania tomorrow. 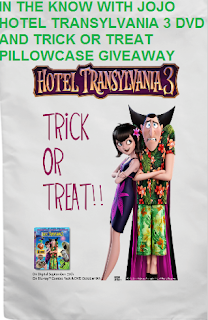 In celebration of Halloween we want to share this awesome Transylvania inspired recipe and Hotel Transylvania 3 DVD and Hotel Transylvania 3 Trick or Treat Pillowcase giveaway. I want to win for my family and our kids friends. They would all love this. Would want to win this for my nephew, he loves this movie.